Our home phone line busted itself today which means both the phone and the ADSL aren't working. The Telstra techo wont be here until Monday to look at the line and hopefully fix it. But luckily we have a wireless dongle with some credit on it, so at the moment we are all hooked up to that. If I'm a bit absent over the next few days, or if I don't reply to your emails, you know why! Back in January, when Femme Fatale cosmetics had their new year sale, I grabbed some polishes I had been wanting for a long time. Cirque Lonesome George was one of those. 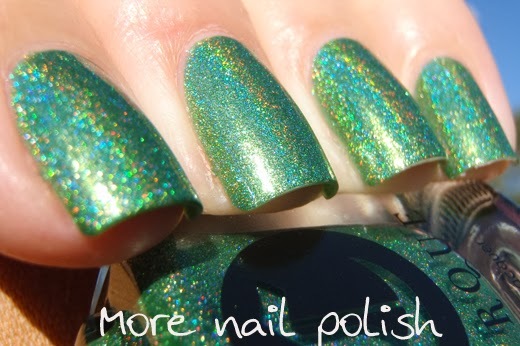 It's funny, I loved the look of this polish so much, but had never bought it in the past because it felt like I was cheating on my beloved scattered green holo Kyrptonite. 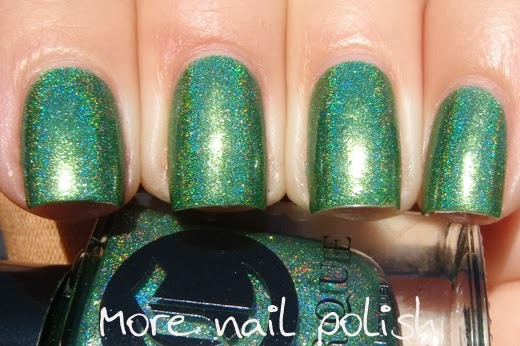 But of course, Lonesome George and Kryptonite have absolutely nothing in common other than being green and both being gorgeous! I don't know why I waited so long to get it. 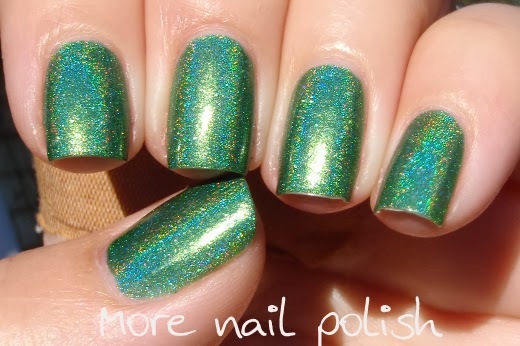 This is two coats of Lonesome George with top coat taken in full sun. 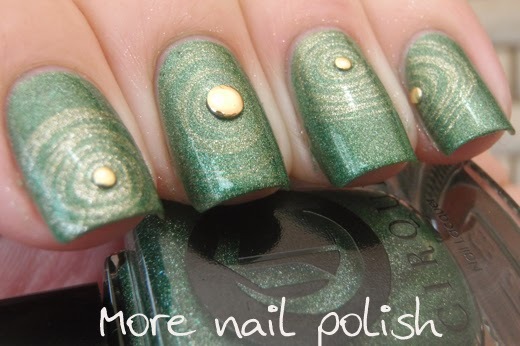 I also wore Lonesome George with a bit of abstract nail art. 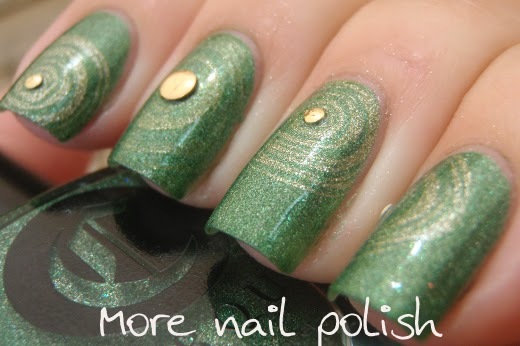 I stamped with Bundle Monster plates BM418 and BM426 using OPI Love, Angel, Music Baby as I had read that it stamped well. 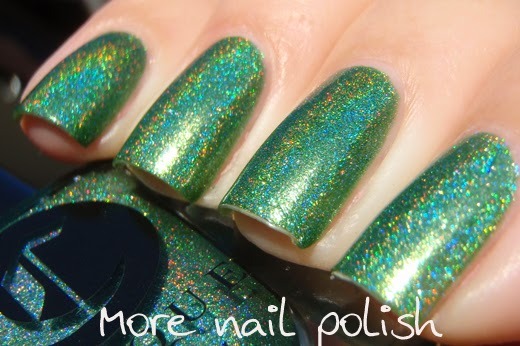 It turns out it doesn't show up much over a green holo though! 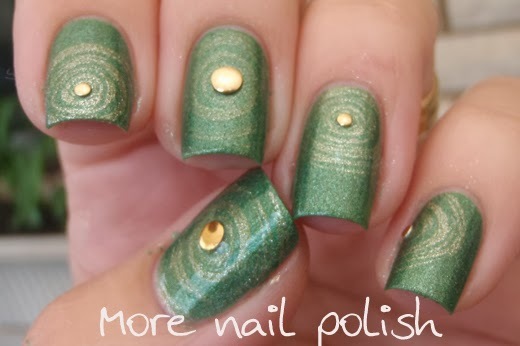 I then placed some different sized gold studs in the middle of the swirled circles. The sun was hidden behind bushfire smoke haze, so there are no sun photos of these, but at least you can see what Lonesome George looks like indoors or in the shade. 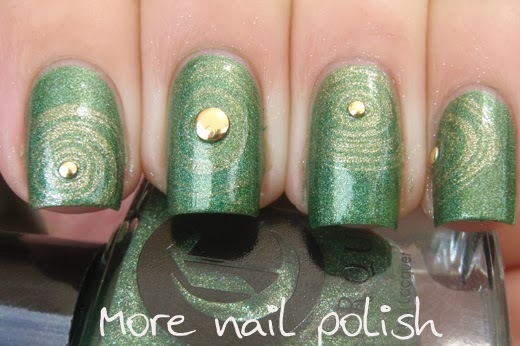 Love the polish and the nail art is really pretty.